"I just saved some pictures from Whatsapp to my iPhone. These pictures are stored on the iPhone Camera Roll. I would like to transfer Camera Roll to PC to save these pictures safely. Could iTunes download Camera Roll to PC? Or is there any method to transfer iPhone Camera Roll to PC?" Connect your iPhone to computer via USB cable provided by Apple. Trust this computer if asked. If there pops out an "AutoPlay" window, click the "Import pictures and videos" option. Then the AutoPlay function would start to transfer iPhone Camera Roll to PC immediately, including pictures and videos in the Camera Roll folder. 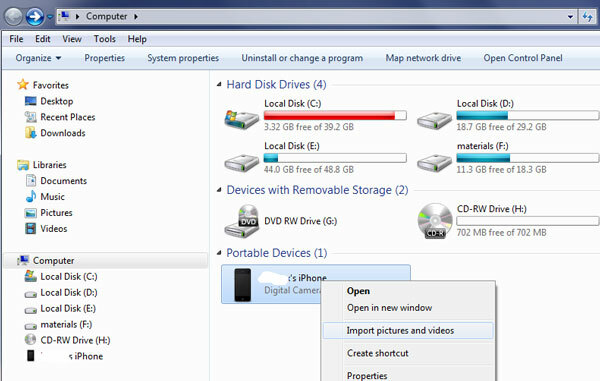 If the "AutoPlay" window doesn’t show up, open "My Computer" (Or the computer’s name) and go to the hard disk drive part to find your "iPhone" icon. Then you could right click your iPhone and then select "Import pictures and videos" to transfer iPhone Camera Roll to PC in batch. Or you could right click the iPhone icon and then choose "Open" option to open the iPhone drive and then choose desired videos to transfer from iPhone to PC. In this way, you could select what you want from Camera Roll to PC for transferring. If you are running an older version of the Mac operating system may not have the new Photos app, but the older iPhoto instead. Note that the steps are almost identical to import your iPhone or iPad photos to your Mac using iPhoto or the new Photos app. With iPhoto and the new Photos app you can import, arrange, alter, print and offer advanced photos after photos are foreign made, they might be titled, marked, sorted and composed into gatherings (known as "occasions"). Below are the steps to transfer iPhone Camera Roll photos to Mac with Photos app. 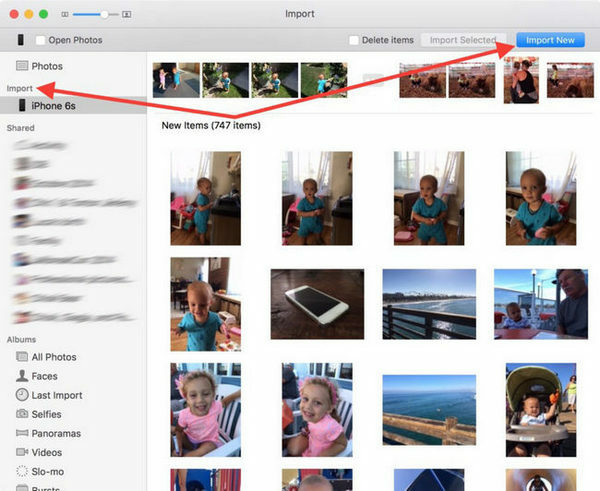 Pick up the photos you want to transfer from iPhone to your Mac, then click on "Import Selected," (if you just want to transfer some photos) or select "Import New" (All New Items). Besides the abovementioned methods to help you transfer iPhone Camera Roll to PC, you could also turn to 3rd-party iPhone photo transfer app to do this, like Leawo iTransfer, a piece of powerful transfer software that allows users to transfer files including music, photos, videos, apps, tones, etc. between iOS devices, iTunes and PCs. It could perform as iPhone Camera Roll to PC transfer to transfer and save Camera Roll to PC in simple clicks only. Open "iPhone > Library > Camera" tab and then select the content in "Camera Roll" group to transfer. You could preview them before determing which to transfer. After selecting which to transfer, right click and then choose "Transfer to > My Computer". Then you need to figure out a directory to save Camera Roll files onto PC. Finally, cick the "Transfer Now" button to start transferring. With Leawo iTransfer, you could transfer multiple data and files like music, video, photos, etc. from iPhone to computer. 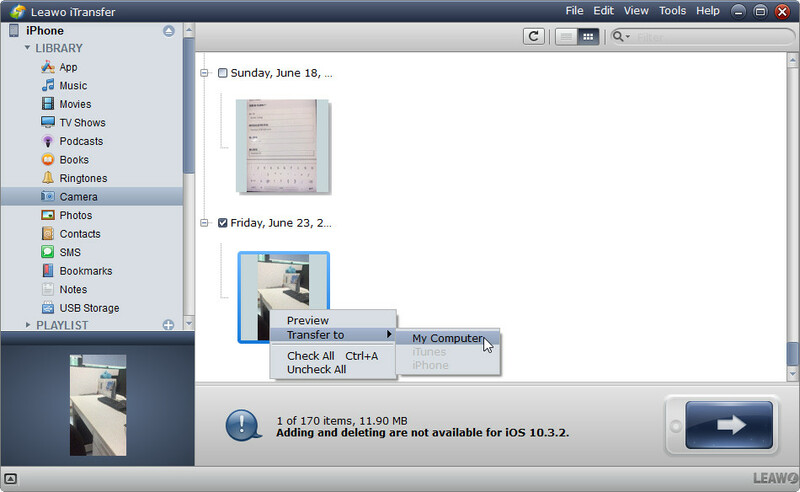 If you’re using a Mac computer, you could make use of Leawo iTransfer for Mac to transfer Camera Roll to Mac as well.